Chicken Cordon Bleu Braid looks impressive and tastes amazing, yet it’s super simple to assemble which makes it a perfect weeknight dinner! Chicken, ham, and cheese all wrapped up in a warm, freshly baked bread braid is sure to make everyone in the family happy! You guys the weeknight dinner time rush is real isn’t it? It doesn’t seem to matter how much I plan dinner time is always hectic. It’s a miracle if all 5 of us are home and able to eat at the same time. Quick and easy meals like Chicken Cordon Bleu Braid are exactly the kind of recipes that help me survive the craziness! You know what else is great about it? It can be warmed up in the microwave for the stragglers. I’ve had a few people tell me their families won’t eat microwaved leftovers and they won’t eat leftovers. Ummm…they’d pretty much go hungry at my house! Hey, I’m just keeping it real here! Leftovers are a huge part of my life! 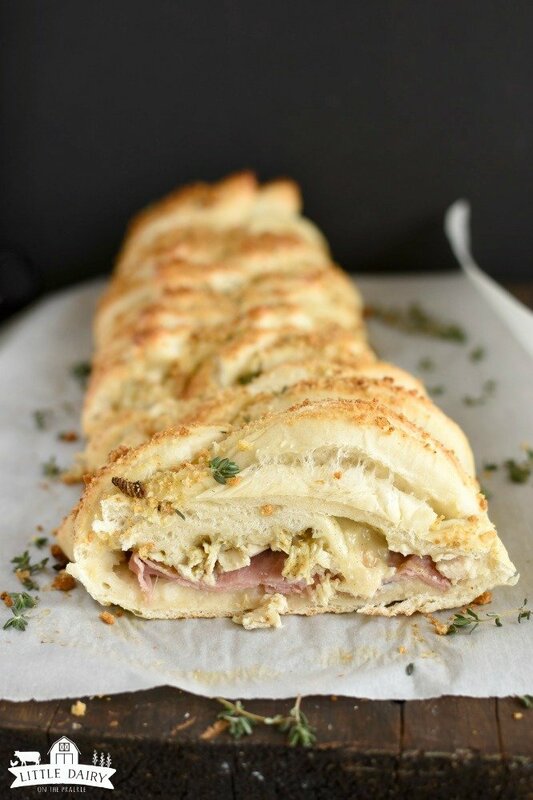 Chicken Cordon Bleu Braid is a great weeknight meal! Now obviously Chicken Cordon Bleu Braid is better when it’s piping hot right out of the oven. There’s nothing like that fresh bread smell, especially without all the effort of having to make it! Rhodes bread has become one of my favorite go to staples. Cinnamon Rolls and Orange Rolls are the easiest breakfast! How do I make that braid? Braids are pretty and they look difficult, but here’s the deal…they are the easiest thing to make! Crisscross strips over the filling. There will be gaps but don’t worry about that. As the dough bakes it will rise a little more and fill some of those gaps in. There will be a few gaps left and that’s perfectly okay! Brush and egg wash on top to make it glossy and golden. You are going to be surprised at how easy is to braid them. Everyone will be impressed too! You’re going to want this sauce to serve with the braid. Let me just give you a little disclaimer: I know some of you would never touch cream of chicken soup with a ten foot pole. I know it’s not homemade. I totally get that. But…when you are in a hurry (and when aren’t you in a hurry) a can of cream of chicken soup is a game changer! And this sauce is downright tasty! If you are an overachiever and want to make your own sauce from scratch I’ve included a recipe for you in my Chicken Cordon Bleu Quesadillas! Have at it! Here’s my second disclaimer of the day: When bloggers take photos we always try to make sure our hands look nice and clean. You know so people would want to eat the food we are taking a picture of. Well, this picture has a picture of my 17 year olds hands. He’s a grease monkey and is always mechanicing on some old vehicle. In fact, his piano teacher asked him to wash his hands before he touched her piano. His hands are actually scrubbed and as clean as they are going to get! Promise! 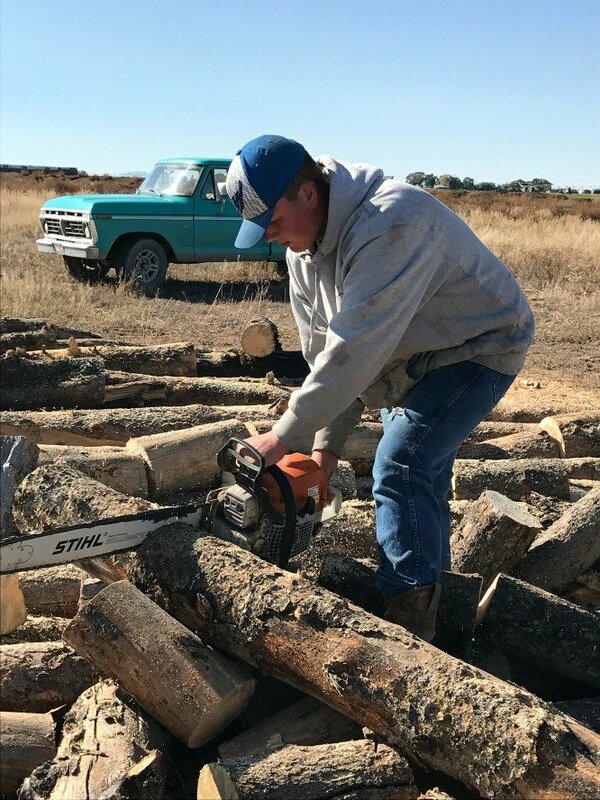 That’s just the way your hands look after you’ve changed the oil, milked cows, pitched hay, and cut wood with a chainsaw! Oh, and that shot of his hand in the photo looks completely out of portion because his hands are so stinking big. It’s not out of portion. That’s really how big his mits are! 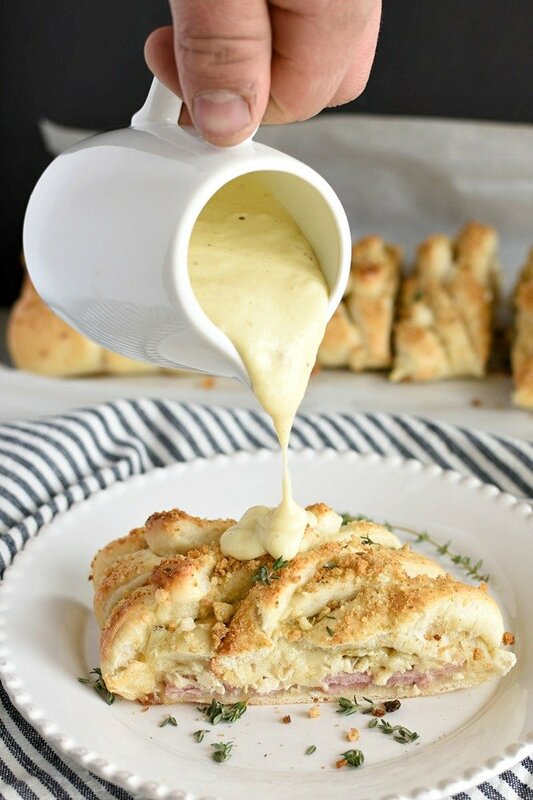 What to serve with Chicken Cordon Bleu Braid! 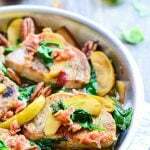 Be sure to print the recipe, save it to Pinterest for later, and sign up for my newsletter so you don’t miss any recipes! 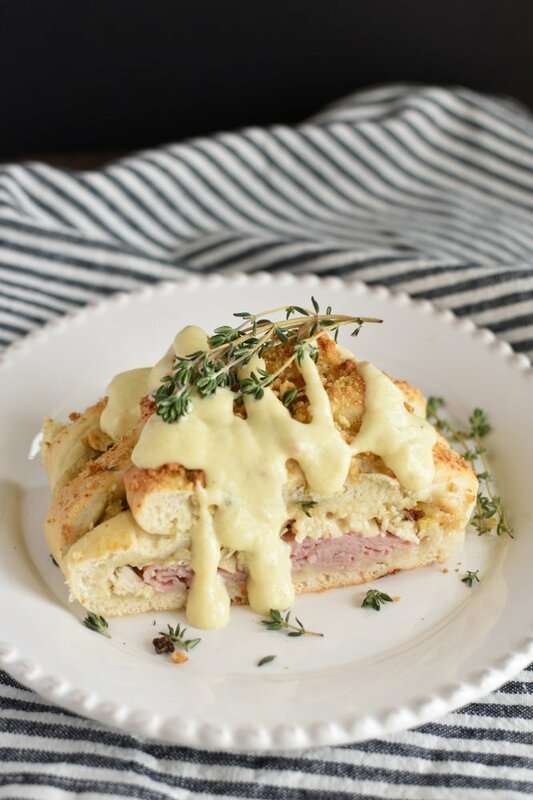 Chicken Cordon Bleu Braid has all the yumminess of diced chicken, gooey cheese, and savory ham all wrapped up in freshly baked bread! If that’s not enough it has crunchy crushed up stuffing crumbs on top! It’s a bit like the icing on the cake! So yummy! 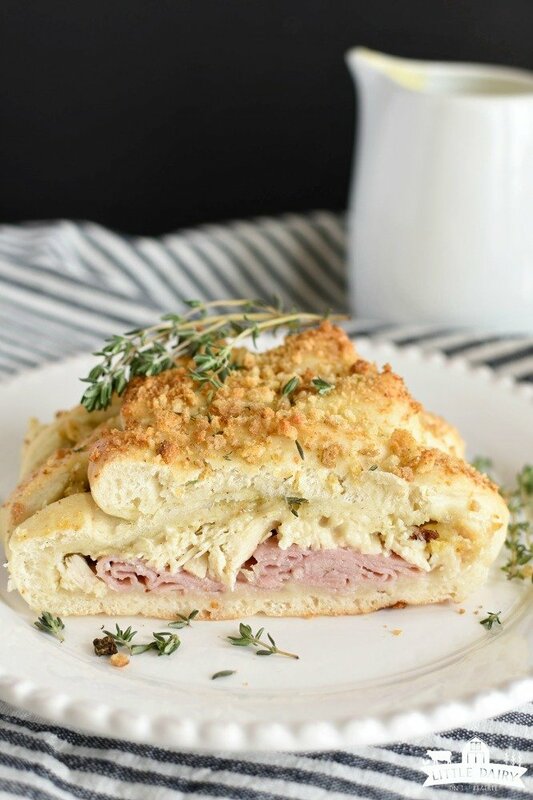 Chicken Cordon Bleu Braid is an impressive, yet super easy version of the classic! It's the ultimate in comfort food without all the extra effort! Trust me there's no giving up flavor with this one! Preheat oven to 375 degrees. Line baking sheet with parchment paper or grease. Roll frozen dough into a rectangle, about 9" x 12". Place on baking sheet. Cut 1" strips from the edges of the dough to about ⅓ of the way to the center on both sides. Cut strips all the way up the long side of the dough. Place deli ham down the center of the bread. 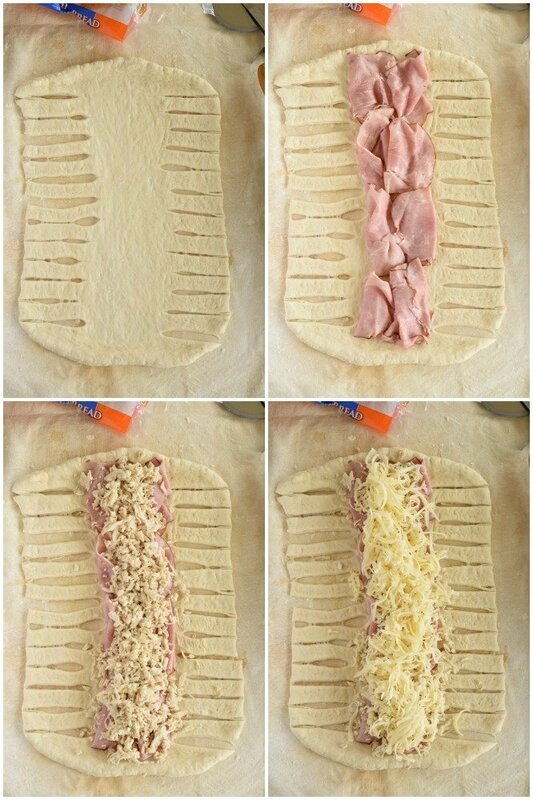 Cross strips over filling to create a braid. Whisk egg and brush it on the braid. Crush dry stuffing mix until it's crumbly and sprinkle over egg wash. 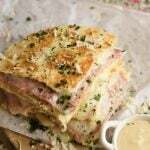 While braid is baking make this super easy sauce for serving the Chicken Cordon Bleu Braid with. In a saucepan warm up sour cream, cream of chicken soup, parmesan, mustard, and thyme. Add enough milk to make it a good consistency. 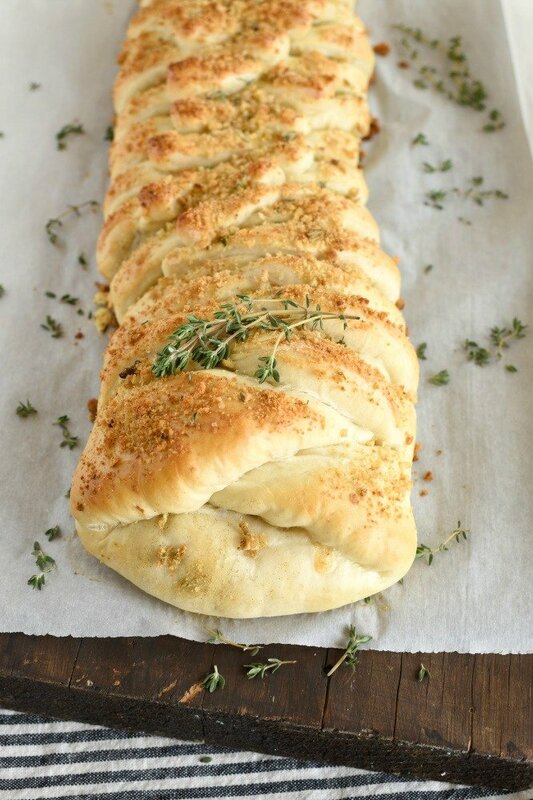 Cut braid in slices and serve with sauce! What a creative braid! 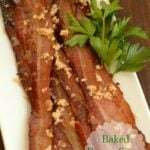 Great for lunch or appetizer for sure! Yes! It’s and perfect for quick lunches! Yum, sounds so good!! That braid looks great! Thanks! Braids look intimidating but are surprisingly easy! Thank goodness or I’d never make them! Love how easy this is to make! Such a great dinner! Easy is the name of my game! Ha! 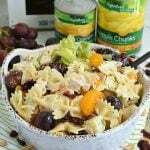 Such an easy dinner option! Love the braid! Braids are so fun! I was surprised at how easy they are to make! I never get complaints from my kids about eating this! Yay! It’s so easy and always a hit! 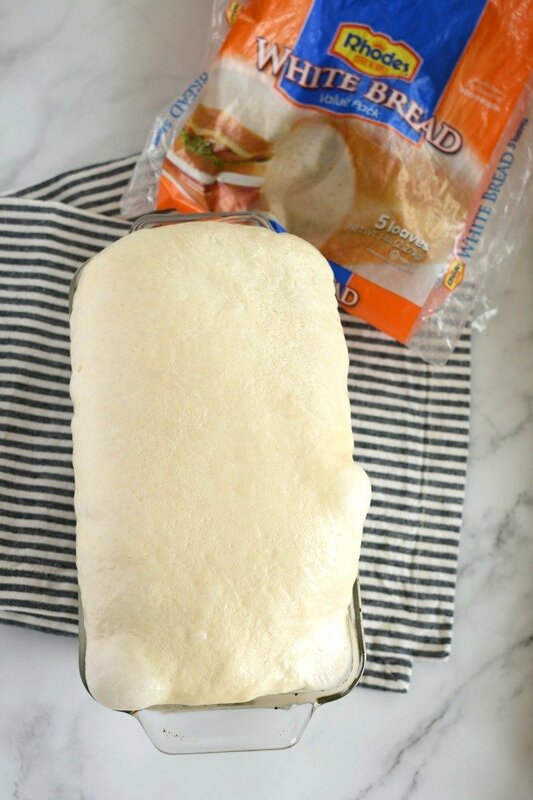 I love how frozen bread so is SO versatile! You can use it for o many things! I can’t wait to try this braid out!